The farmhouse brewing traditions of southern Belgium influenced their neighbors across the border in France. The Brasserie La Choulette in Hordain, France produces Bière de Garde, a style with strong ties to Belgian Saison. La Choulette has been brewing farmhouse ales since 1885. 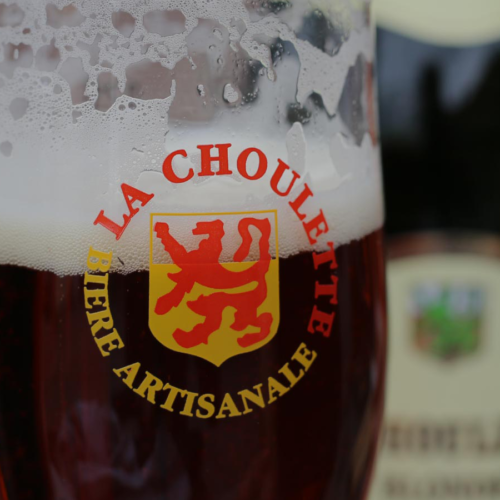 La Choulette is known for their expertise in producing delicious Bière de Garde beers and it comes through in the delightful raspberry fruited beer. The base Bière de Garge is aged on raspberries to give this beer a crisp, fruity character. PAIRING ONE: A spicy taco with dreamweaver hot sauce, avocado, crispy rice and pepper jack cheese paired with Brasserie La Choulette Framboise Biere de Garde. PAIRING TWO: tostada with whipped feta, carne asada, pickled red onion, cilantro paired with Yazoo Brewing Company ETF Abeille Wild Farmhouse Ale.